Meghan Vogel runs track for her high school, in Ohio, and she totally knows that sportsmanship is not about being the best at the sport. When the runner in front of her fell during a 3200-meter race, Meghan stopped, helped the fallen runner up, and walked them both across the finish line. If you ask me, that is so a first place finish. _ Here’s my first post from an article I read in Teen Voices.com (see previous post for more info on that site and magazine). Bullying is all over the news now, which is good, because Kathy tells me that although there was lots of bullying when she was a kid, nobody did anything about it or even talked about it. What’s different now is that people also bully online. That’s harder to deal with, because the bullies can be anonymous and/or they can gang up on victims. You’d think people would have better things to do, but whatever. It’s annoying, evil and wrong, and there are lots of kids trying to fight back. Lior Solaimani is one of those Real World f.g.s fighting the online bullying thing. She’s a high school student in New York, who took a stand after a classmate who had been bullied committed suicide. She raises money and spreads awareness by selling bracelets that protest bullying, and she works with her school’s Pay It Forward club. So I joined this group, teen voices.com. They have a website/blog and they also send out a magazine a few times a year that’s written by teen girls, about really interesting subjects that all fit pretty nicely into the Real World f.g. concept. The Fall 2011/Winter 2012 issue had pieces about using social media safely, profiles of female chefs, the problem with using underweight/underage models in fashion shows and magazines and cyberbullying. There are also book and music reviews, and original fiction by teens. Check it out at Teen Voices. Expect some of my upcoming blog posts to be inspired by articles from the fall issue. Maren Johnson (16) collected leftover soaps from hotels for the Global Soap Project, which turns them into bars for countries that need them. Dylan Mahalingam (16) raised money for Under the Acacia, to build schools in Kenya, and Rujul Zaparde (16) co-created Drinking Water for India and raised money to build wells there. My total favorite is Connor Dantzler (17) who founded Health through Humor, which donates joke books to hospitals. How great is that? There are more of these kids, but the post would be endless! And I would be exhausted. In later posts, I'll zoom on a few, so you can learn more about their projects and organizations. 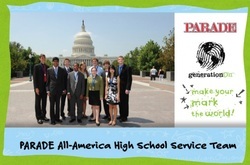 To find out more about this whole All-American Service Team thing, visit generationOn.org. There are a LOT of Real World F.G.s profiled in this article my Dad ripped out of the newspaper for me. They're all teenagers picked by Parade magazine and Points of Light Institute/ generationOn. Benjamin McMullen (17) started two local groups that do things like teach kids about wetlands in his area and planted over 1000(!) trees. Charles Orgbom (15) ran an eco-group called Greening Forward that organized litter clean-ups and recycling programs. Find out more at generationOn (including tips on becoming a Real World F.G. yourself). A Basketball-playing Real World F.G. This is Allan Guei, a player for the Compton High School basketball team and Real World f.g.
Allan entered a Free Throw Contest, which had a prize of $40,000 -- and won. Because he was given a full scholarship to Cal State Northridge in addition to the prize money, he donated the $40,000 to the seven runners-up in the contest! He said he felt like his competitors "were all smart and wanted to pursue their dreams, but were having financial difficulties...it was the right move to help the others, especially when everything else was taking off for me." Every year Nick Cannon hosts an event on Nickelodeon honoring teens who are Helping and Leading Others (HALO). This year the TeenNick HALO Awards features David Beckham, Jessica Biel, Lady Gaga and Taylor Swift who are partnering with these teens who are working to create social change in their communities and around the world. You can get involved too. Go to How Do You HALO? and upload a video describing what you can do in your community to make a difference. The cool part is, your video may be chosen and shown during the awards ceremony! What makes this year extra special though, is that Nickelodeon is partnering with DonorsChoose.org for a two-week campaign that will translate user's clicks and activity into real life donations to at-risk schools around the nation. HALO Awards airs November 6 on Nick at Nite and November 7 on Teen Nick! I'm not really the sparkly type, as you know, and I'm definitely not the cheerleader type. But one of my nicest friends is a cheerleader. (You know who, if you've read "Don't Expect Magic.") And I know that f.g.s -- real and fictional -- usually are sparkly. The whole thing started with two cheerleaders in Illinois with siblings with disabilities. Every year they would spend one night coaching a clinic for kids with disabilities in cheerleading and in other sports. Then, they decided that one night per year wasn't enough. And that's why they formed the Sparkles Squad. They later created the Sparkles Effect, which helps other kids create their own Sparkles Squad in their communities. The website has a starter kit with tips on creating a local Sparkles program. How can you not love an organization called "Keep Reading!" The Keep Reading Foundation was created by Sarasi Jayaratne, a student at Cornell University (where Kathy, my "creator" as she calls herself, went to college). Sarasi is not technically a teen, but she was a teen only a couple of years ago, so she's "teen-adjacent." Plus, she sort of started her foundation when she was a sophomore in high school, when she raised money to help schools in Sri Lanka (where her parents are from) after a tidal wave hit it. Eventually, she started the foundation and she's visited the country a lot since then, to distribute the books that the foundation's money buys for kids there. Sometimes the books come with reading glasses for people in poorer areas, so they can -- yes, you guessed it-- Keep Reading! MeanStinks is an app on Facebook that allows people to be "nice" online on their wall. There's fun ways to graffiti and also a way to get guidance on a particular problem you may be having. And fun Shout Outs from Amber Riley (Mercedes on GLEE). Makes being nice fun! ... and nice! There are people in the world who try to do good and grant wishes -- without using a wand and without there being anything in it for themselves! Amazing. Because I'm in awe of these non-f.g. f.g.s, I figured I'd post about them here. If you know any, let me know and I'll add them to the list.